Garret B. Stanley’s article, published in 1999 in the Journal of Neuroscience, outlines how activity of neurons can be decoded into a reconstructed image. Stanley claims the decoding algorithm is simple since each point in space can be reconstructed at high resolutions from 6 to 8 pairs of cells. The more neurons are tracked, the higher the quality of the reconstruction. The following still frames from a video (top) are actual reconstructions (bottom) from the activity of 177 cells in a cat’s brain. This is very scary – am I right in thinking this is the first stage towards directly reading minds? As mentioned, this is pretty old news, though no less cool. I don’t think it has much to do with ‘reading minds’, since the cognitive/consciousness stuff is still basically black-box territory. If it were possible to extract the brain’s own reconstructed imagery (quite a bit of what we ‘see’ isn’t actually sensed by the eye, but rather interpolated by the brain), or to witness ‘imagined imagery’ (Think of a box within a circle, without actually seeing it), then you’re getting closer to mind-reading. This cat-eye stuff seems more like splicing into a video feed. Old news, then I must be out of the loop. This is frightening and intriguing all at the same time. If this is true, it could potentially be used for things like artists or designers. I cant count how many times I’ve wished that I could just take something as I see it in my head and get it out into the world. Heck, imagine someday a team of special-effects brainiacs who’s job it is to conjure up impossible things in their minds to be translated to film and used in future movies and sci fi films. The possibilities seem endless. Doesn’t this portend that we may one day be able to upload our minds? Sure, we’re just starting with fuzzy pictures, but the scanning may soon be able to look elsewhere, perhaps even into places we’ve repressed. If it becomes possible for us to “read” minds would it not be possible for us to reverse the path and beam images directly into the brain? This has more to do with intercepting the “video” coming from the eyeball, nothing at all to do with your thoughts or memories. Considering our dreams exist in the visual center of the brain. I see possibilities of making visual records of our dreams. This would be awesome. Seeing all those dreams that you forget so easily… If they could only do it without direct contact, somehow reading the potentials remotely. maybe a ultra utral high resolution cat scan? Well, if you were to sleep in a cat scan, you would have to lie perfectly still all night. I wouldn’t be albe to do that, unless the had some type of thin- no nevermind, my mind needs sleep. Now this would be very interesting if you could record visions people have while on drugs like LSD or DMT. Dude this stuff is leet. Just think of the possibilies. Cats could be the scouts of future wars. They could also be like a video camera when you don’t have one. Espionage – nobody suspects that a cat is recording everything it sees, but recording the video feed of the cat would make the cat a secret video camera. I wonder how long it will be until someone finds a way to extract audio from the cat’s brain. If its possible to intercept video from the eyeball to the brain, maybe there will be a way to inject video. It’d be like a personal TV! or more like a creepy halucination – either way it would totally freak out your cat! Folklore and reported incidents (and hollywood, or course) all claim that cats can see ghosts. They need to keep the video running so we can see some spooks! signals sent from our eyes. Your mind does not read an image like a jpeg. Your brain receives images in inconsistent, layered and lightning fast streams of information that only a human brain can make sense of. Sorry to spoil the party. But could you tap into someone’s memories of past events? The encoding of memories would be combinations of all the senses, scattered over neural complexes all over the brain. The memory “images” would probably be rather indistinct, except perhaps for highly intense ones. This tech might be combined with rapid cooling and blood-for-saline substitution to possibly retrieve the last images from a dead man’s brain, preserved by chilling the recently deceased’s body. If the short-term memory center could be tapped in a similar manner. I’d still like to strap a tiny video cam atop a cat’s head and watch it chase a mouse up a flight of stairs. Okay, first of all, it’s not fake. Secondly you CAN input video to the brain. They are actually still doing video trials on people that could once see but have since been blinded. There was even a news report about it showing a man that had lost his eyesite driving in a parking lot. They took micro cameras mounted them to a pair of glasses and converted all of it into signals the brain new how to read. The man said it was pretty blurry and depth perception really wasn’t there BUT he could see well enough to drive through a turning path of cones only hitting a few. 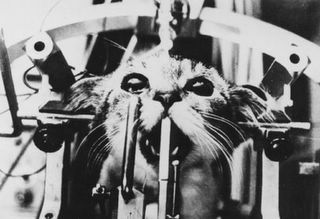 It’s not right to do this to innocent animals…the scientists are gouls and should be put to death. Like OMG!! This could like totally be used for MIND READING OMG! If it was true it would be very exciting. But I like the way pretty much everyone has ignored the fact they hack animals to pieces to do this kind of research. Theres a strange thing about the way humans use animals, the fact that if we didn’t, these animals wouldn’t exist. If we suddenly stoped farming animals for food they would become extinct. Through history we have changed animals so much that they become helpless in the wild. Im not sure what im saying, but its interesting. yea the blind people. it s good thing to hear.. but we know all good stuffs use to be for bad things. whatsoelse.. it is really good thing to watch a dream. if mind could be recorded on a versatile disk.. wow. a perfect sector could be the greatest in the world like movie sector. for example; an schizoid paranoid person’s dreams.. i say just wow. great industry.. “the dream movies – benitto’s dream vol-II” lol. u must be kidding. this is a great thing. like sci-fi movies.. Yes a loop can be established in what I see as and have had confirmed by K. Warwick as a cybernetic relationship, Whereby info can be sent in both directions (nervous system to nervous system, nervous system to computer) I would like to augment cognitive capabilities through mutually plastic neural feedback loops between organic(human) and synthetic(AI) intelligences via microwave relays. You can read minds with imaging, that would require processing the electrical impulses for sound not imaging. This is the beginning of the end for us dudes. Eventually there will be hard copy, irrefutable proof that all men are pigs. Well this experiment used neurons in the LGN which is (as far as we know) little more than a relay station between the retina and the visual cortex proper, so wouldn’t be activated by any imagining or dreams. The top-down influence of imagining etc. certainly happens but I’m not entirely sure how low down that gets (not my field of research) but it certainly won’t get down to the lowest (most basic) few levels of the visual cortex.